With the elevation of former Supreme Court Registrar Mr. B. Sudheendra Kumar, one more Judge is added to the famous “Classmates Bench" in the Kerala High Court. Justice Sudheendra Kumar became the 6th Judge appointed to the Kerala High Court from the 1979-82 LL.B Batch of Government Law College, Ernakulam. When they studied in the same class at Government Law College, Ernakulam, they might never have dreamt of being Judges together at the Honourable High Court of Kerala. But destiny had decided that five of the classmates are Judges at the same time and it would be more colourful if destiny has also decided to constitute a division bench with them only, in the coming days! They are Justice V.K.Mohanan, Justice C.K.Abdul Rahim, Justice P.R.Ramachandra Menon, Justice A.M.Shaffique and Justice P.V.Asha who is the latest entrant to the Bench. The 1979-82 LL.B Batch of Government Law College, Ernakulam is blessed with a rare honour of having five of their classmates as Judges of the Honourable High Court of Kerala. They can boast of being a unique Batch and may not have any competitors in Kerala or even in India. It was Justice V.K.Mohanan who became the first Judge from the Batch. Justice C.K.Abdul Rahim and Justice P.R.Ramachandra Menon followed him to the Bench. Later Justice A.M.Shaffique joined them. 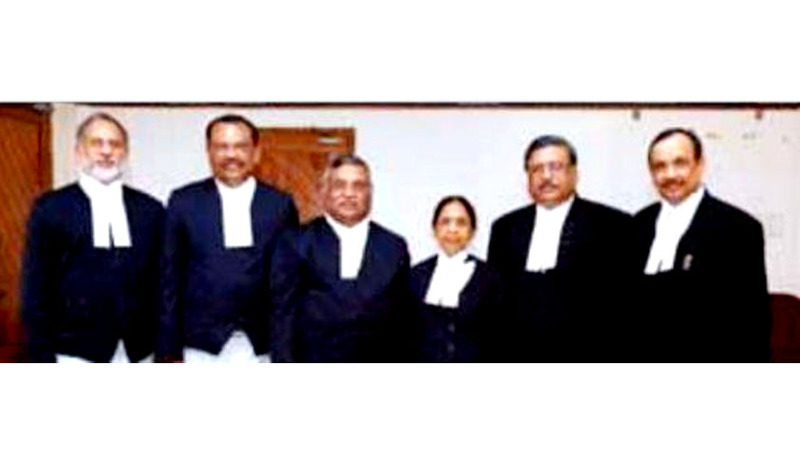 Justice P.V.Asha, the lone female was recently sworn in as a Judge on 21-05-2014. Their Class had strength of 100 and six of them are no more. Senior Advocates and known Politicians have already given much fame to the Class. A gathering of classmates was organized in the year 2007 by Justice C.K.Abdul Rahim and 70 of the 100 had participated. An alumni association was formed in the name LACE ’82 and their latest gathering was organized on 17th February 2013. The friends are now planning a colourful event to celebrate the elevation of Justice P.V.Asha. The Government Law College, Ernakulam, formerly known as ‘His Highness the Maharajas Law College’ was established in 1874 by the Maharajah of Travancore. This year will be a milestone in its history with the rarest of the rare “larger bench” of six classmate judges sitting together at the Honourable High Court of Kerala. Seven new Judges were sworn in as Additional Judges in High Court of Kerala yesterday. The Other Judges sworn in include another former Supreme Court registrar Sunil Thomas, Shaji P Chaly, Anu Sivaraman ,Raja Vijayaraghavan, K P Jyotheendranath and Mary Joseph.